This text introduces the Bible to new believers, and is a resource forastors, Sunday School teachers and college students. 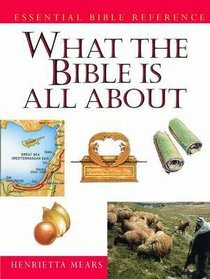 About "What the Bible is All About (NIV Edition) (Essential Bible Reference Library Series)"
DR. HENRIETTA C. MEARS is well known as the teacher of some of the most influential Christian leaders of our time, including Billy Graham and Bill Bright. She was the founder of Gospel Light, GLINT and Forest Home Christian Conference Center, and the author of the best-selling Bible handbook What the Bible is All About. Miss Mears died on March 20, 1963, leaving behind a ministry that still thrives today.